Cyclists in the City: "Quietways": If you want to know what Boris's cycling plans for London look like, take a look at what's rolling out right now in Camden, Hackney and the City of London. There's going to be a lot more of these sorts of streets coming soon. "Quietways": If you want to know what Boris's cycling plans for London look like, take a look at what's rolling out right now in Camden, Hackney and the City of London. There's going to be a lot more of these sorts of streets coming soon. Warren Street in central London. Formerly a rat-run to the Euston Road. Camden set out to address a problem that is common all over central London and especially so in neighbouring Westminster: "Most of the time the area experiences relatively light traffic...delivered at least in part by the one way systems throughout the wider Fitzrovia area that are designed to discourage through traffic. Unfortunately this also reduces the permeability for cycling, despite many of the streets being ideal quiet roads within central London." Part of Fitzrovia is in the City of Westminster. Westminster's streets are rat-runs for motor vehicles and plagued by one-way systems that make it near impossible to cycle through. Those exact same streets in Camden are now massively nicer places for walking and cycling than their equivalents in Westminster. Thanks to borough policy. It has removed several traffic lights and replaced these with zebra crossings on speed tables. This makes it easier for motor vehicles to get through without constant stop-starting. And it makes it easier to cross the road as the cars are going more slowly and you don't have to wait for a green man to cross the road. It has turned a maze of one-way streets into streets that are almost all two-way for cycling. And last week, it closed Warren Street to motor vehicles to stop taxis and minicabs using the street as a ratrun to avoid the junction at the top of Tottenham Court Road. These are policies that have been used to great effect already in Hackney. 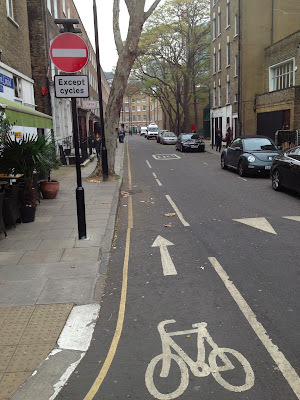 Vincent Stops, Chair of the Planning Committee on Hackney council has explained very neatly in his new blog that Hackney's policy has been about "incremental change on Hackney's streets to: create a better balance between pedestrians, cyclists and motor vehicles. There has been an equality of esteem for both movement and, crucially, urban design. Almost every intervention on Hackney's streets has improved its public realm and benefitted both cyclists and pedestrians." I'd urge you to read Vincent's blog post. It captures in a nutshell what's been happening in Hackney over the last decade and the Camden philosophy seems very similar indeed. Fitzrovia is not now a car-free nirvana. But compared to 10 years ago, the place has changed hugely. When you cycle through most of the streets here, you now feel like you're on equal status with motor cars. Not on every street, but on a serious slice of them. Frankly, it's quite uplifting to cycle here knowing that you're no longer the underdog on the streets. Camden council is going to roll this same strategy out in Camden Town in the area between the Royal College Street bike track and Camden High Street. This is a zone of one-way impenetrable streets that makes it nigh-on impossible to cycle from the bike track into the centre of Camden. Same plan as Fitzrovia: fewer traffic lights; more two-way streets for bikes; some roads closed to through traffic. Hackney has been doing this for nearly a decade now. And it clearly works. As Vincent Stops points out "With just a few road closures a whole area has become cycle, walk and play friendly while still allowing residents to drive to their homes." play-friendly. And you can still drive to your home"
Boris's document slightly misses the point that this strategy isn't just about cycling. It's about creating a better neighbourhood for everyone. Bye bye to unnecessary traffic lights, hullo to calmer streets and less rat-run traffic. If you link streets like this together, you end up with a really useful cycling network. For example, Hackney's Pitfield Street route takes you the whole way from behind Moorgate in the City of London all the way to Dalston on streets that have been made calmer and easier to cycle on than anything I can think of in west or south London. 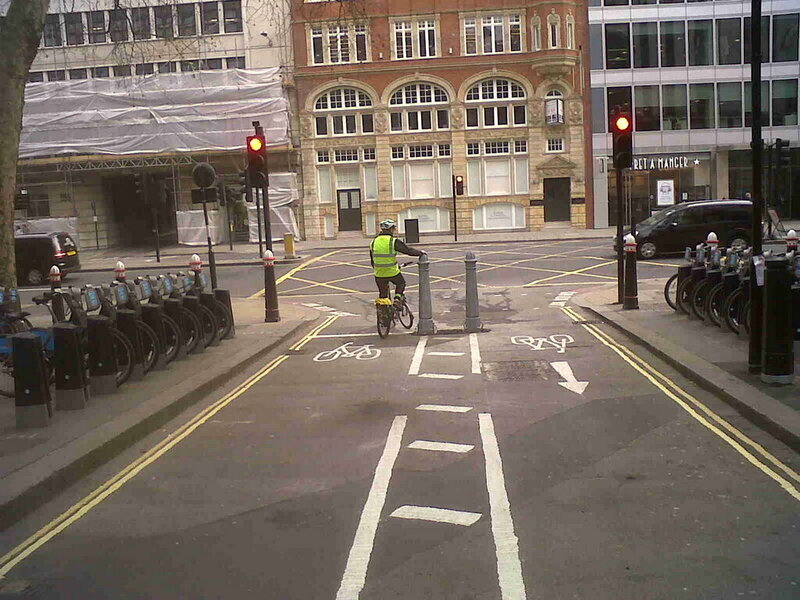 Stonecutter Street, City of London, is now a bike-only street. Even the City of London is catching up with this same model. Earlier this month, the City shut Stonecutter Street in the heart of the Square Mile. Or rather, it didn't shut the street. It just blocked the street to rat-running motor vehicles. The City of London was very clear about why it wanted to shut the street to through motor-traffic: "The dominant use of Stonecutter Street is as a cut through route for traffic moving south-eastbound from Holborn Circus to Farringdon Street. This conflicts with the character of the road, the local activities, and the interests of pedestrians and cyclists." The City is expecting the number of people cycling and walking here to continue growing at pace and needed to find a way to make the area safer and more appealing to walking or cycling than driving. Hey presto. 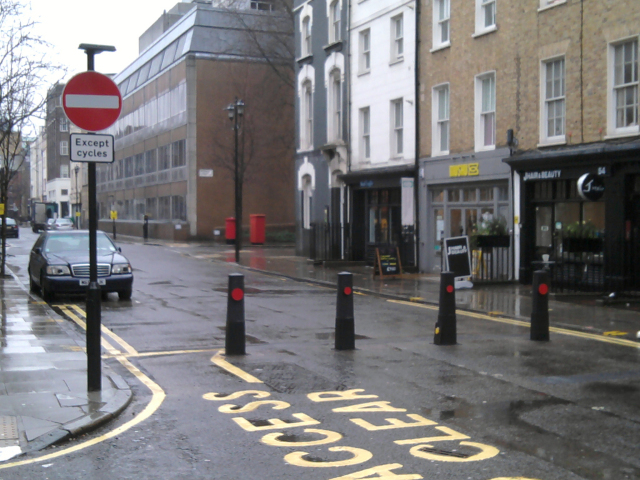 Two bollards popped up at the end of the street. Bicycles and pedestrians only. The City is making a sizeable number of its one-way streets bi-directional for cycling or pedestrian and cyclist only. Again, similar to Hackney. What the City isn't doing yet with quite the same success is linking those streets up so that they become a network, like the Dalston to Moorgate link that Hackney has built along Pitfield Street. That needs to happen. bike route through Covent Garden. A complete and utter joke. What also needs to happen is that Transport for London needs to work with the boroughs to alleviate obstacles on this Quietway routes. The routes all too often become unstuck when they reach a main road and - in the words of the fantastic Bella Bathurst in The Guardian this week - "At present, there are a small number of wonderful cycle routes joined together by a lot of very big city and however cleverly you dodge and weave through the backstreets, eventually everyone ends up being spat back on to the dual carriageways. If you're an experienced cyclist, that's fine. If you're not, then you ride scared, and if you ride scared then you're dangerous." Hackney's Dalston to Moorgate route is one of those "small number of wonderful cycle routes". Get to Moorgate, however, and you're on your own, dodging and weaving along four lanes of motor traffic on London Wall. Not impressive. The City of London and the City of Westminster are both crucial to the future of cycling in London. Because once you arrive at Moorgate, you shouldn't be dumped into car-choked race tracks and left to fight it out on your own. You should expect a similar quality of cycling experience from end-to-end. And that needs the boroughs to play nicely with each other and with Transport for London. That's not happening yet. The City of London's strategy for the area around Liverpool and Moorgate, for example, would be funny if it wasn't so tragic. The policy is (genuinely) to "Review the current hierarchy of cycling routes, and explore the possibility of encouraging alternative routes through the quieter streets of Hackney and Islington." I have to hope that Andrew Gilligan will focus minds in the boroughs and encourage them to build a network of routes that maintain a similar quality from end to end, regardless of which borough they're in and regardless of main roads which get in the way. Excellent Danny; that is the biggest challenge for Gillingham: find the can opener to open the brain of motor-moronic Westminster. Gillingham sounded positive when interviewed today, but ultimately the leverage needs to come from local residents. Who is designing the Grid? A hint is that the London Rail team has been infiltrated to the Roads team for cycling, but equally worth noting that the delivery of London 2012 seems to have brought in a number of retired military transport specialists. If anyone can apply efficient and pragmatic thinking to transport and logistics it is someone with British Military training. One story I had heard is that construction vehicle operators were insisting that they needed huge trucks with high ground clearance to thunder round London's streets in a mega macho style. One of the ex-army folk pointed out that they had driven around on battlefields with less horsepower and ground clearance and never got stuck - so why was this needed for civilian sites in London? The Army will also know of the success of the Viet Cong in moving people and supplies in challenging conditions - against a motorised and massively mechanised enemy. To move people and supplies you need to cut the clouding of the issue generated by focussing on moving the vehicles rather what they contain. We some of this in Outer-London as Biking Borough events and Sky Rides are not going to do it! Before you get carried away with praise for the City of London, try riding around the Square Mile. The road surfaces are lethal. Constant road works create horrible dips and potholes, frequently on junctions making cycling in traffic dangerous. Why they do not ensure that the utility companies return the surfaces to a usable and safe state is beyond me. Construction traffic is ever growing and site traffic management amateur and seemingly concerned only with the swift ingress and egress of site traffic and not safety of road users and pedestrians. Lombard Street, a one way street made two way for cyclists is, simply, a pedestrian or cycling accident waiting to happen. 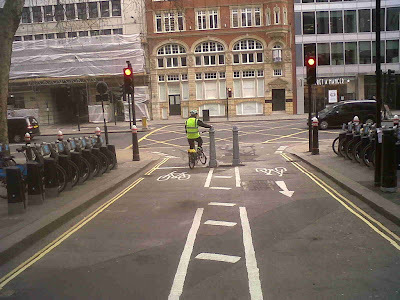 The City of London is unaccountable to most people who work there and this, sadly shows in their attitude to cyclists. Enlightened Camden is almost a delight to cycle in thanks to the street closures, segregated cyle lanes, cycle contraflows in one way streets, and other measures. You feel like cycling is at the heart of their transport policy. Their recent College Street Consultation confirms that their designs are getting even better. It's a shame that Westminster are so backwards thinking! Let's pile on the pressure! Why do they persist in their car-centric ways! I can't for the life of me understand why they want more motor traffic, more fumes, more congestion?? They will eventually work out that Camden, Hackney, Islington have got it right all along, but in how many years' time? What I hope now happens is Camden Fitzrovia suddenly starts booming and all the small business in Westminster realise that car parking out side your shop or cafe isn't the whole answer. Camden are only the eastern end of Oxford St, Roads north of Oxford Street outside their authority include Wells Street with its Borris bike stand you can't get to from the south as it's one way and in close proximity to the joys of Oxford Circus where Westminster have removed all ability tfor cyclist to make it safely from SW to NE of the junction. Sorry if this isn't the right way to get in touch with you, but i couldn't find a email address. I am contacting you from a brand new event happening this May bank holiday, Spin London-The Urban Cycle Show, and would like to give you a couple of free tickets for our opening night on Friday the 3rd of May. Please contact social@spinldn.com for the tickets, and this is our website www.spinldn.com. Great post. This kind of infrastructure does seem like a fantastic improvement that is both quick and cheap to implement.